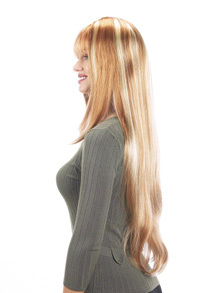 Long beautiful layered wig with bangs. The layers on this wig are fairly long, not short layers throughout. Stylists note: There are some wispy short hairs near the back and sides of this wig, something to think about if you're planning on putting this wig up. The part is slighly to the left (if you're facing the wig). With a skin top (a plastic scalp, for those not in the know) in the center of the front. This lets you change the part and retain a more natural look. Cosplay uses: Misuzu Kamio from Air. Sophitia Alexandra from Soul Calibur 3. Leica from Silver Chaos. Layla Hamilton from Kaleido Star. Ryoko from Real Bout High School. Tsumugi Kotobuki from K-ON! Shanoa from Castlevania: Order of Ecclesia. Any cosplay that needs very long hair, some very long layers and/or may have a braid in the back is a good fit for this wig. New Look wigs are generally very soft (unless otherwise specified in the text). Tinting them with ink or wig dye may be more difficult (compared to a Kanekalon or Toyokalon fiber wig), and curling these requires higher heat then a kanekalon wig. All New Look wigs run a little larger in cap size. Back nape of wig cap to end of hair: 23 inches. If you need a shorter option, try the Alicia XL. Need your New Look wig soon? The dropship option is always faster If you are ordering only New Look brand wigs, we can ship your order to you directly from the California warehouse for an additional $2.00 fee per order. This will get your wig to you much faster no matter where you live in the USA. We can only offer UPS ground freight for this option. This is only if you are ordering New Look wigs that have this option, wig caps, wig clamps, cosmetics, tights cannot be dropshipped since we keep those items in stock here. All the color swatches are intended to show you the general color of each wig, we cannot guarantee the exact hue of the wig that you may receive due to manufacturing processes. Unless otherwise specified, wigs are one solid color and are not streaked - the swatches show you the natural color variation that occurs depending on what lighting you are in.